All Photobooths are not created equal! Here are the questions you should ask all photo booth services you are considering for your event. You should also meet in person before booking. At the meeting you should see sample photo strips, pictures of the booth(s), sample designs, discuss room layout and plan for the photo booth, client expectations, and go over paperwork the photo booth service should have to help in your planning. What do you want in a Photo Booth? Q – Do you offer enclosed booths, open air booths, or both? A – We offer both styles of photo booth. Be sure you know exactly what style booth you are getting. Enclosed, or “classic” style photo booths provide a more private type of booth experience. They can fit fewer people, but provide a private or semi – private experience. Open style booths can fit more guests, come with your choice of 24 backdrops, and have a more upscale look. Q – Does your booth have an external monitor? Do you have a live slideshow? A – We do not have external monitors because they defeat the purpose of the private booth experience. 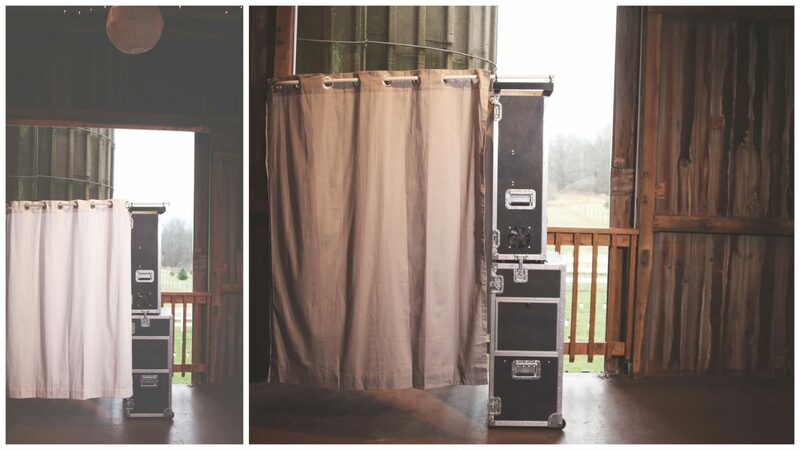 We do not recommend using this when booking a photo booth for a wedding or private event. We do not have a live slideshow for the purpose of the private booth experience. Q – What does your photo booth look like? A – One of our goals was the nicest looking booth experience in the area. We have our booths displayed as many places as we can. On our wedding page and Facebook page. If other services do not have a picture of their booth prominently displayed, be cautious. Most photo booths are not very nice looking. We are happy to share examples of other booths we have encountered through our other event services. Many other booths use a pop up tent to enclose their booth. This does not look nice, may have a zipper in every photo, and do not fit in many venues. You also want to avoid the “bounce house” photo booth. 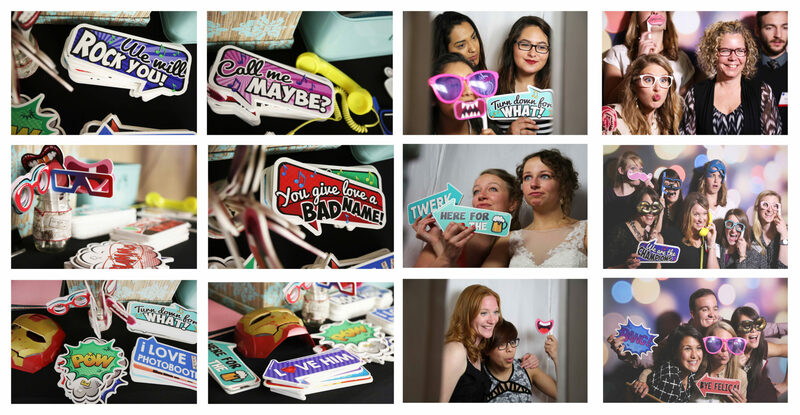 You want a photo booth that looks like a carefully planned part of the night. Q – What do the photo prints look like? Can I see them in person before booking? A – In our client meetings we have a sample book which shows side by side examples comparing our photo booth strips and other services in the area. We offer 2×6 strips, 4×6 prints, and horizontal strips. You will be pleasantly surprised how our booths match up. Every client who has met with us in person & compared our prints to others in the area, has booked with us! Other photo booths usually provide strips with poor quality pictures, bad lighting, poor (black) curtain color, flimsy or thin strips, ink stained photo strips, and many other less than ideal things. Q – How many people can fit in the photo booth? A – Our enclosed booths can fit up to 6 guests. Our open or kiosk style photo booths can fit as many as can fit on the screen. Other booths may have a large pipe and drape enclosure to offer clients. These are usually very bulky, dark, and large. We do not recommend using one of these style photo booths. Q – How many photo strips or 4x6s print out? A – Our booths print up to six strips or 4 4×6 prints (as needed) thick feeling, beautiful, and vibrant strips each session. We like to print a strip for all, or nearly all, guests in the booth. This adds to our already faster speed. Larger groups do not need to go in many more times for each person to get a photo strip. Some photo booth services only print one or two photo strips per session. Most services charge extra for additional prints. Q – Do the photo strips come out cut? A – Our photo strips come out cut. This comes back to speed. No wasting time or playing with scissors. Q – How do I receive my event photos? A – This is another area where we excel over the competition. You will receive your event photos through prints for guests, email sharing, an online gallery, or optional Facebook, Twitter, Instagram, or Text sharing. Other photo booth services provide a CD of images mailed to you the next week. We feel that the use of CDs/DVDs for your images is dated. Q – Can I add a logo, artwork and/or text to the photos? A – Please! We create a custom design for each of our clients. We want to make something truly special or branded for your event. We provide this service free of charge and in most cases before booking. You will see exactly what your photo strips will look like before you put down a retainer. You may also create your own artwork for the photo strips if you so choose. Q – How many pictures does the booth take each session? A – Our booths are set up to take one to three pictures per session depending on the clients choice of print size and layout. 2×6 strips, we take two to three photos instead of four. We prefer this set up again, for speed. It also gives us a larger area for your custom designed artwork. 4×6 One to three photos. Q – Do I have a choice of color scheme? A – Yes, we offer color, black and white, sepia, negative, sketch, slow motion video, animations, cinemagraphs, GIF booth, and light painting. We can also set up your booth station for one or multiple options. Q – Do you offer props? A – Props are always included in our pricing. We provide a wide array of high end, durable PVC signs, and stick props. Goofy glasses, masks, and other fun stuff are included too. These are much different than the “cardboard on a stick, we see as the industry standard. Some services charge for props. You are also welcome to bring your own and add them in the mix. Q – Do you include a memory book or scrap book in your wedding and private party pricing? If yes, what style and size is it? A – We at FastBooth believe in open and honest pricing for our services. We always include a scrap book with our wedding, birthday, and graduation party events. As for style, we match your event with what we have in stock. We use specialty full size 12×12 scrap books. We use multi colored sharpies and the high end, thick scrap booking paper. We try to stay away from the “black book, black pages, gold & silver pens” which has become what most services offer. Most photo booth services charge for a scrap book. Q – How fast does your booth print? A – Our photo booths print in an industry fastest 2 strips or 1 4×6/6.8 seconds! Most photo booths print in 15-60 seconds. We’ve experienced units at 60+ seconds for one 4×6. Although this may not seem like a big difference by itself, when you have a large number of guests at your event, it adds up very quickly. Q – Do you carry insurance? A – We carry damage and liability insurance. The most our clients should be held liable for is a $500 deductible. A – We include set up & tear down, booth attendant(s), a print for each guest per session, memory/scrap book, custom artwork design, online gallery of your event photos, upgraded pvc props, idle time for dinner, and anything else I might have forgotten. We have no up charges or hidden fees. Q – What is your payment policy? A – We accept cash, PayPal, credit/debit cards, and checks for payment. We also offer financing. Your retainer may be paid with any form listed. Final balance by check is due 30 days before your event. Final balance may be paid by cash the day of your event. PayPal and credit must be paid 14 days prior to your event. Credit card transactions are subject to a small processing charge. Q – What about “idle time?” What is it and do you offer it? A – Idle time is important for weddings. This is the time between bridal party arrival and the end of dinner. We like to close the booth once the wedding party arrives. During the next 60 minutes few guests will be using the photo booth, but the ones that do will be a major distraction. This is when your introductions, toasts, prayer, cake cutting, and dinner will be taking place. One of our biggest concerns with other photo booths was guests laughing loudly and talking in other booths while these special moments were supposed to be the focus of attention. We like to open the booth back up towards the end of dinner, and provide a “soft” close during formal dances and bouquet toss. Why should you pay for time when barely anyone will be using the booth and also risk disruptions during special events? Most photo booth services charge for idle time. Q – What is your cancellation policy? A – If a contract is cancelled, a cancellation charge will apply to the purchaser. This charge amount varies depending on the contract total. Q – Why should I choose your company over your competitors? A – You should choose one of our photo booths because of our industry experience. Katie – a former event manager at one of the top five wedding venues in the country & now full time photographer & photo booth master and TJ – top level award winning DJ with 10 years experience. We saw what photo booths were out there (we still see them) and we wanted to provide something better. A booth experience that doesn’t cause disruptions, take away from the dance floor, booths that look nice, and get you the most value for your money. When you add up the things other services charge for, in nearly all cases, you will be paying more or the same for much less. We know what it takes to make your photo booth experience the best it can be! Colors, Theme, Etc, other details we should know?